This is the reason why some tourists come to Milan. 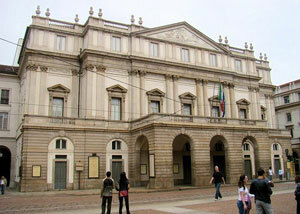 It is one of the world's most prestigious opera houses. It was opened on the 3rd August 1778 under the patronage of Maria Teresa d'Austria, to replace the Royal Ducal Theatre which was destroyed by a fire in 1776. It was designed by Giuseppe Piermarini, the great neo–classical architect, and it was opened by Salieri's opera, "L'Europa Riconosciuta". Later the ballet was included and the repertoire was expanded. 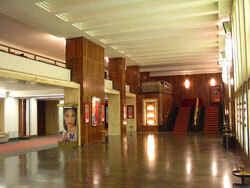 The Scala Theatre was destroyed during the second World War, was rebuilt and later reopened by Toscanini. The theatre closed in 2001 for restoration but the new season was opened in december 2004, with the opera which consacrated the first opening in 1778, the Salieri's one directed by Riccardo Muti. Find here more information about La Scala Museum. It was founded in 1938 and designed by the architect Lancia and was run by Remigio Paone, Luigi Pirandello's, friend until 1977. This theatre has always tried to showcase the most innovative shows of the times and many important authors have represented their works in the Teatro Nuovo. For example, Peppino de Filippo with his "Natale in casa Cupiello". It was founded in 1979 by Fiorenzo Grassi and Gianni Valle. It was originally called Teatro di Portaromana until the theatre company Teatridithalia expanded to occupy this theatre and changed its name to the Leonardo and the Elfo theatre. It represents drama: Fassbinder Rimbaud Camus and Pasolini. Its long tradition of featuring spectacles, writers and directors, began in 1850, when seven noblemen decided to found this theatre to reinstate the importance of prose. It was opened by "I martiri" of Carlo Torelli , "Amore senza stima" of Carlo Ferrari "Kean" by Dumas and many others. Nowadays it also offers Sunday–morning jazz concerts. The architect Giuseppe Pestagalli was commissioned to design and construct this building, which was named after the Milanese Dal Verme family and has the capacity to seat 3000. Construction was finished just a year and a half after it began - openeing in 1872 - and completely full of 19th century architectural characteristics. Destroyed during World War II and restored three years later, in 1946, it was used as a cinema for a long time and later as a venue to host music events and concerts. This theatre was built in 1964 by the architect Gottardi and comissioned by Cardinal Montini – who was appointed Archbishop of Milan then and subsequently Pope Paolo VI. 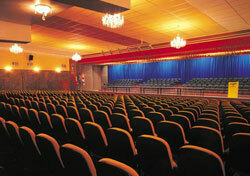 The San Babila theatre is a modern building that boasts a room with perfect acoustics and is equipped to simultaneous translate for international congresses. In some ways it represents the temple of prose, and greatest Italian actors – such as Paolo Stoppa, Aroldo Tieri, Peppino De Filippo, Nino Taranto, Glauco Mauri, Rossella Falk, Ernesto Calindri, Lauretta Masiero, Giulio Bosetti, Enrico Maria Salerno, Renzo Montagnani, Giancarlo Sbragia, Lella Brignone, Gianni Santuccio, Sara Ferrati and many others – have performed on its stage. It features productions of the Teatro del Buratto and has a strong hand in the search for and promotion of young talents. It was founded in 1947 by Paolo Grassi and Giorgio Strehler, the most important italian theatre director of the second half of the 20th century. The first play acted was "L'albergo dei poveri" by Gorkij. Although it offers only 500 seats, and a little stage, the Piccolo Teatro is a theatre of art for anyone, and it proposes a diverse and international repertory. The Piccolo Teatro remains as the historical head office while there are two other theatres built in different periods, which are part of the Piccolo Teatro. See Nuovo Piccolo (Teatro Strehler) and Teatro Studio. 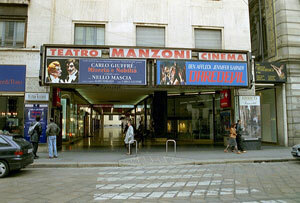 By the 70s Giorgio Strehler wanted to built a second theatre larger than the previous one. Now it showcases ballet and the Mediterranean Theatre Festival. This is an experimental theatre opened in 1987. It represents the house of music of the Giuseppe Verdi Symphonic Orchestra and Choir of Milan. 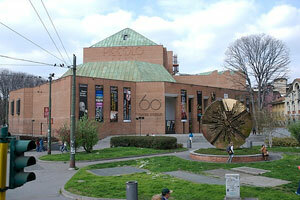 A few years after its inauguration in 1999 it became one of the most important cultural poles of the city. The hall of the auditorium was designed and constructed to host different activities including symphonic music concerts, choral and chamber, jazz and light music, recordings by digital systems, promotion of events by satellite TV and projection room by a big screen. When it opened in 1940 it was solely a cinema hall, but during the 80s- under the artistic direction of Gianmario Longoni- it became a space dedicated to showcasing theatrical events. The Smeraldo theatre currently represents an ideal and special stage for Italian and international performances, including musicals and recitals interpreted by great actors. Just to mention some: Evita, A Chorus Line, Jesus Christ Superstar, West Side Story, The Phantom of the Opera, The Rocky Horror Show, Cats, Mamma Mia!. It gives particular attention to dance, so that we can say that artists like Moses Pendleton, David Ezralow and David Parsons are regular guests of the theatre. Metro LINEA 1: fermata PRECOTTO – poi a piedi fino a Largo Mattei, quindi il tram 7 (con fermata stazione di Milano Greco).